In September 2009, the Pew Research Center for the People and the Press updated its series on the public's view of the press, a set of reports that began in 1985. 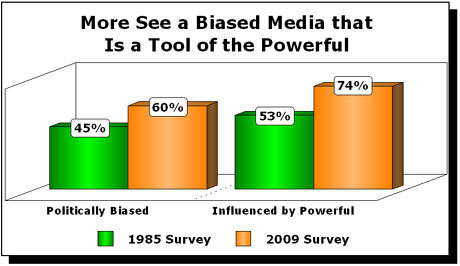 The 2009 survey of 1,506 adults found low confidence in the media's accuracy, objectivity, and independence. The report also found a widening partisan divide in how Democrats and Republicans rate individual news organizations.